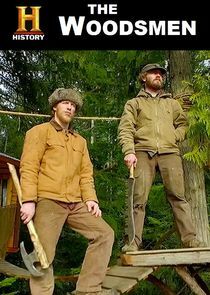 The Woodsmen gives viewers a look into a world they've never seen before. Hidden in the thick forests of the Pacific Northwest, a select group of men have sought out the ultimate freedom–a life in the treetops far removed from the trappings of modernity. They live in primitive structures built with their own bare hands. For these men, living in the trees is the American dream.It's life on their terms, free from the encumbrances of the city and traditional 9-5 work. They each have their own reasons for dedicating themselves to the trees, but this life doesn't come easy. Amidst the rugged landscape that is the Pacific Northwest, surviving off the land is only possible with a diehard commitment and highly developed survival skills. Meat is hard to find, vegetation is frozen and supplies are low. Using age-old skills and innate ingenuity, these woodsmen carve out the lives they've chosen amid a harsh, unforgiving landscape. The Woodsmen tracks the stories of Mike, Steve, Ethan, Aza and Jay as they develop their tree structures, build the essentials for off-the-grid living, hunt, forage, barter and do whatever it takes to thrive in the most unlikely of places. The men race to complete one of the biggest projects they've ever tackled; and two woodsmen deal with pushy intruders.